The Signature Room: Lunette over the left windows of the room. The lunette containing the Cardinal Virtues (which represent "Good ") is built around an allegorical theme. The relationship that binds the three figures together is clear and harmonic. Fortitude, dressed in armor, sits in the shade of an oak tree. Prudence is placed on the highest step of the base. She has two faces: one of a young woman who looks at her reflection in a mirror handed to her by a winged putto; the other, of an old man, the symbol of old age, of which prudence is the chief quality. Finally, Temperance is represented holding a pair of reins. 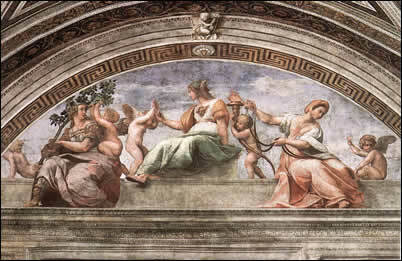 The allegory was intended to include the figure of Justice as well. 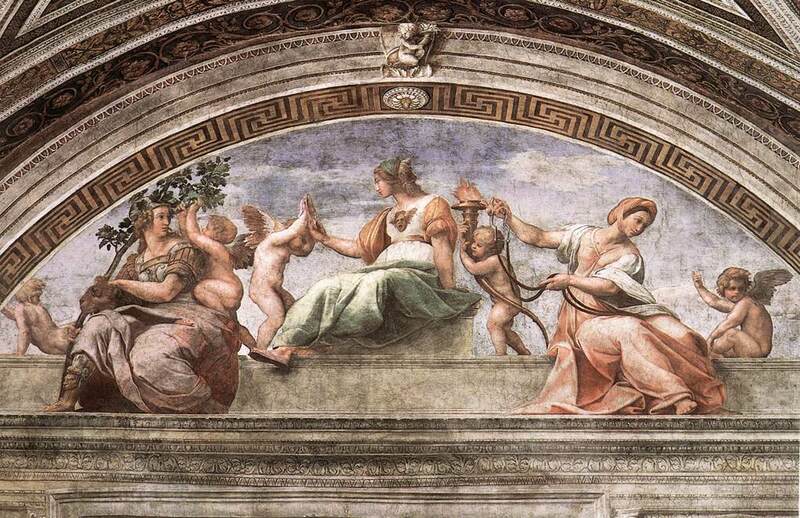 But Justice, being considered superior to the other virtues from a hierarchical point of view, is represented separately in one of the tondi of the vault. Three winged genii symbolize the theological virtues (Charity, gathering the fruits of the oak; Hope, in the centre with a flaming torch; and Faith, at the extreme right, pointing toward the sky). Two additional putti complete the composition, giving the whole scene a free and graceful movement. Science should favor the development of human cooperation and it could be a particularly appropriate instrument to build more equitable living conditions for all humanity in a globalized world. Our age of knowledge and information could lead to new kinds of opportunities and perspectives that have to be understood and directed to the common good. The centrality of the human person like the higher and most valid reason and objective for any kind of research, is not only central for a religious sensibility and approach to life, but also in a larger cultural framework. Human beings are indeed a special part of the universe, because of their capacity of giving meaning to everything. At the same time, human beings are a part of this whole, a part of the nature. The preservation of nature is thus taking care also of humanity, of its life resources and of its wellness. Science participates in the search for truth and provides the elements necessary for a knowledge that has to be necessarily multifarious. Science is very important nowadays, and it is a fundamental element to understand our time. The role of philosophy, as a rational bridge between science and technology, one one side, and ethics and religion, on the other one, is essential against any type of fundamentalism, laicism and irrationalism. The philosophical analysis helps to decipher the contents of science in their epistemological, ontological, and ethical issues. This affects, both the internal debate among specialists, and the common sense view of the world. The specialization of the knowledge and the interdisciplinarity of the approach: these are the main lines within which any scientific research has today to be developed and disseminated. Thus, the involvement and cooperation of specialists, from different fields and disciplines, has to be enhanced and favored. The scientific knowledge should be disseminated, so that an ever wider number of people and of young people overall, can appreciate the results of research and the beauty of nature, which for the believers, are as many reasons for thanking God. “It is important to interpret reality by looking it in the face. Ideological or partial interpretations are useless; they only feed illusion and disillusionment. It is important to interpret reality, but also to live this reality without fear, without fleeing, without catastrophism” [Pope Francis, Meeting with the academic and cultural world, 22 September 2013].